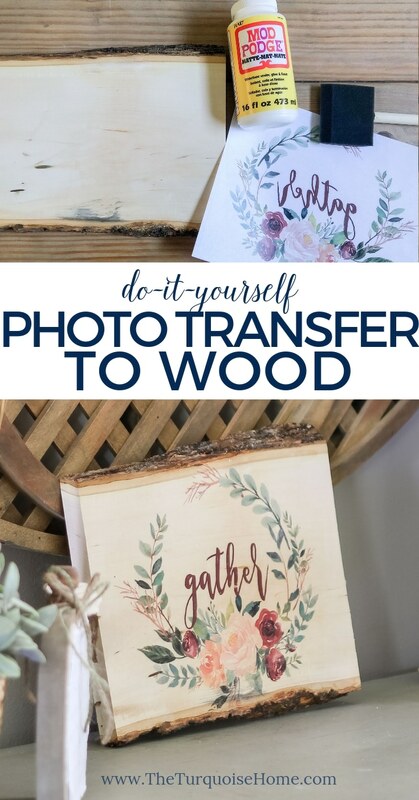 Transfer a photo to wood with these 4 easy steps! And it’s super budget-friendly, too! 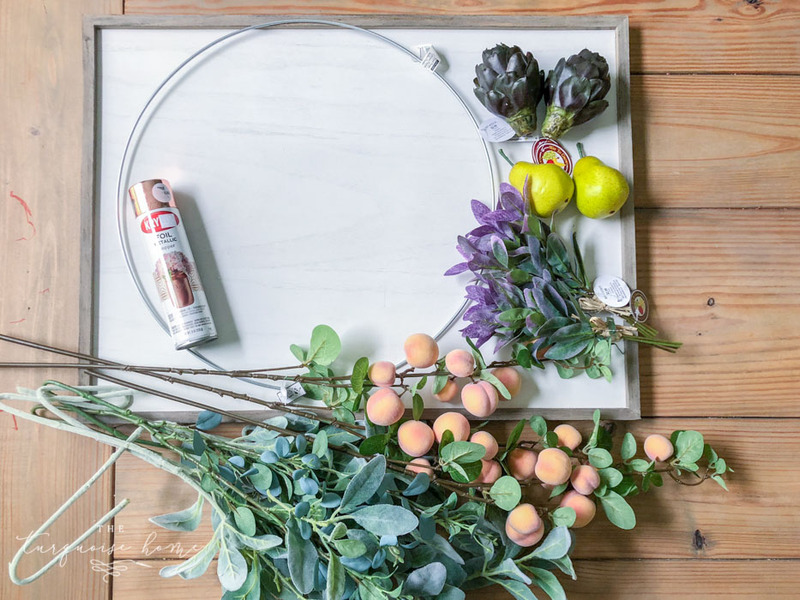 Use a free printable or your favorite photo for a fun twist on decorating with printed images. 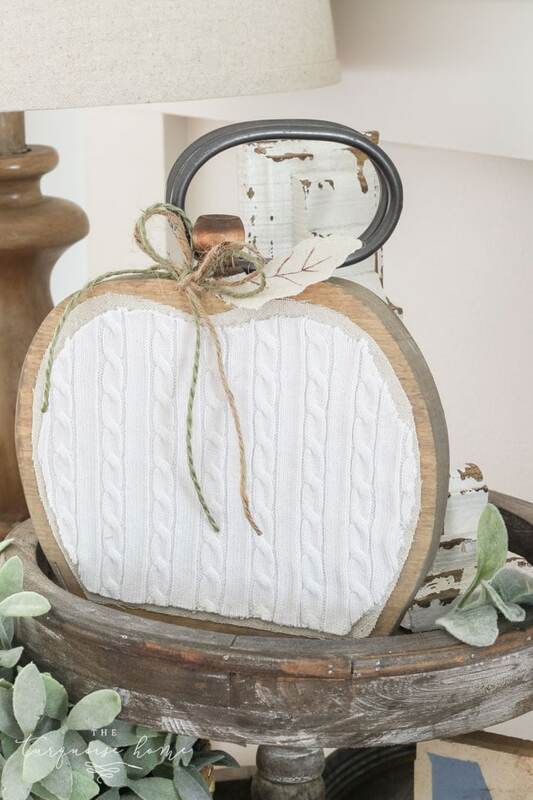 As a perpetually frugal home decorator, I love making beautiful home decor with things that are free or that I already have around the house. 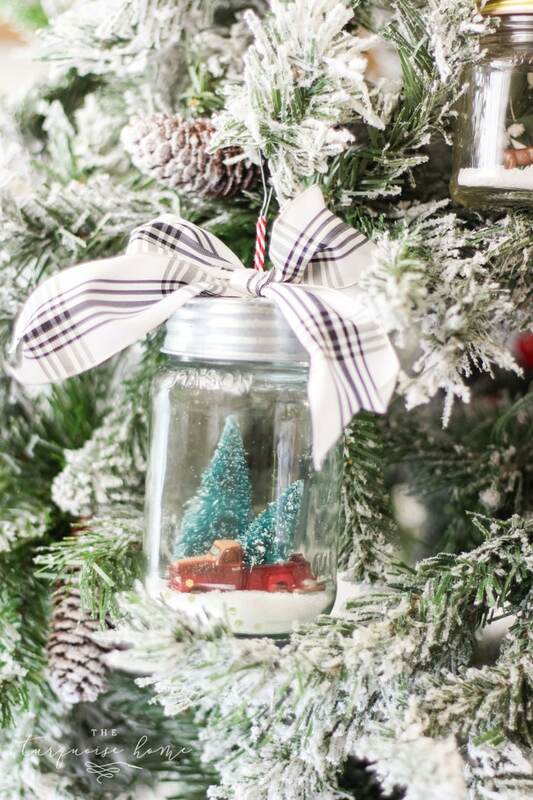 This is why I LOVE decorating with free printables. Cheap & easy – and all you need is a good color printer. 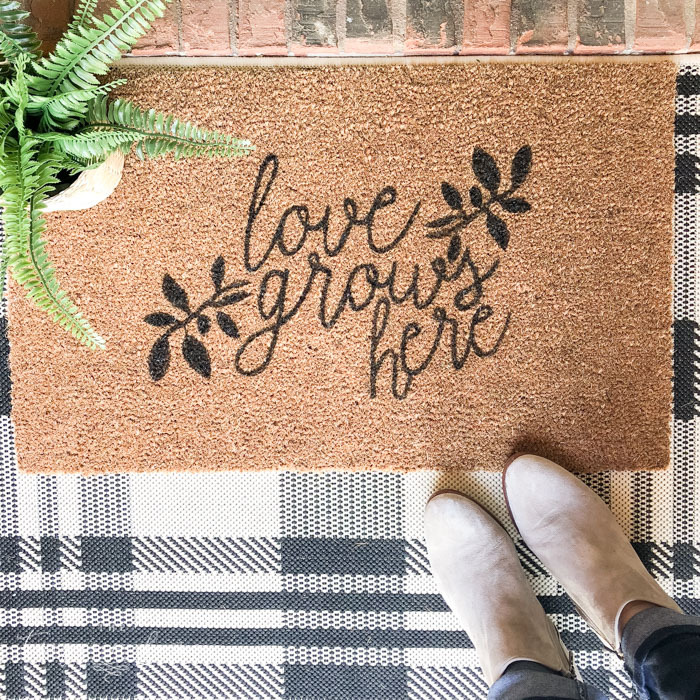 Super fun fact: I recently figured out a new way to use a free printable in our home! Yay!! Bring out the cheering squad. 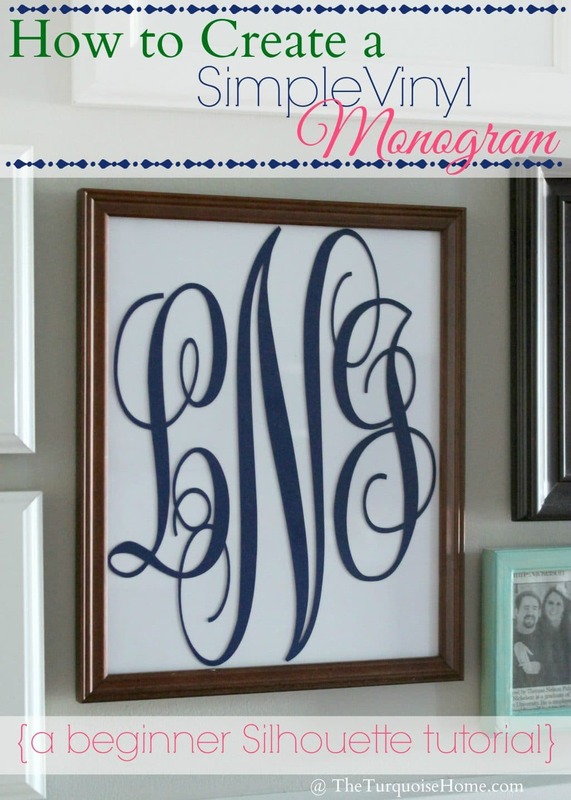 I’ll show you just how easy it is using a Mod Podge photo transfer method. It’s literally 4 quick steps. 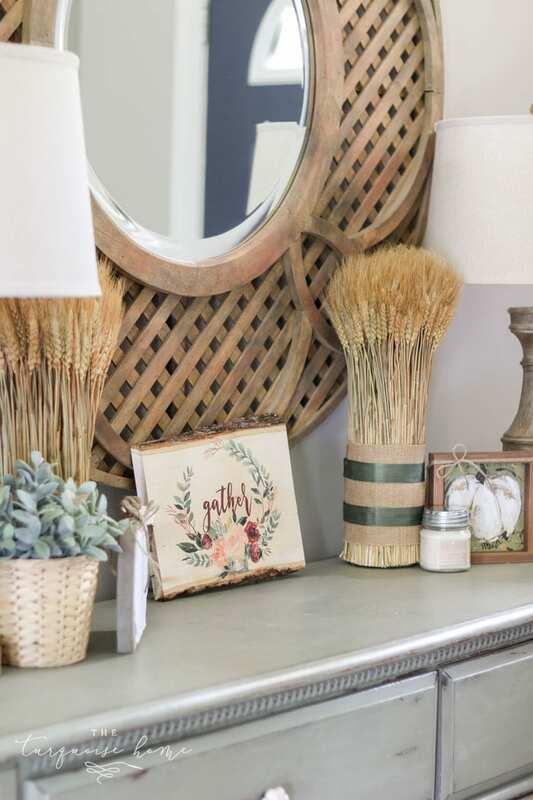 The hardest part is waiting for it to dry, so just plan ahead a little bit (exercise a little patience) and you have yourself a gorgeous piece of new decor! Note: you can always use a colored photo as well instead of a printable. 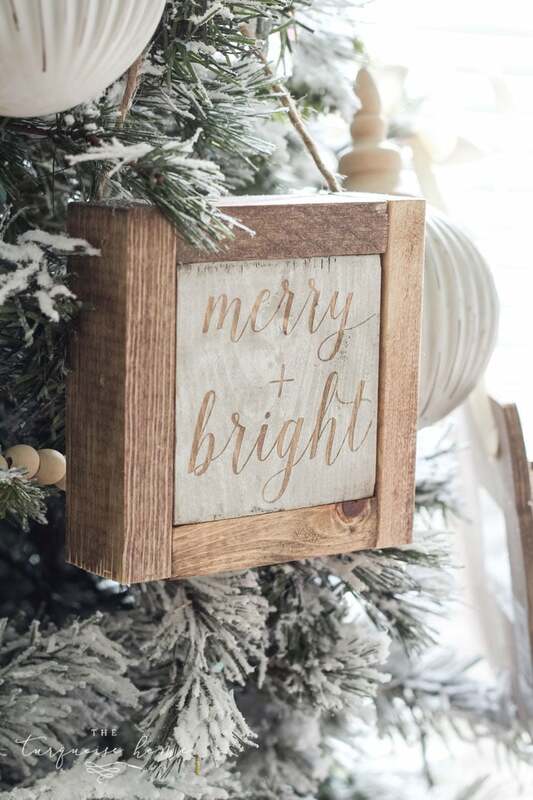 So, any sentimental photos that you have would make a great gift idea transferred onto wood! ** If you are already a VIP e-mail subscriber, you can find these printables in the free printable library. The access to it is included at the end of every e-mail I send. Step 1. Print out your image or photo. 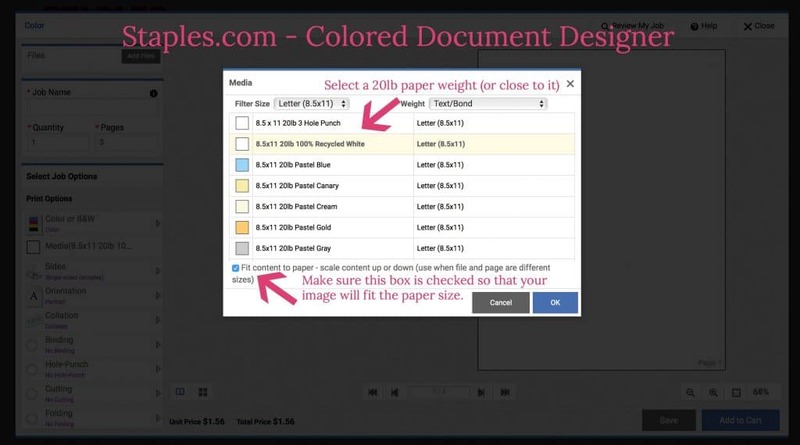 You want to make sure of a few things before you print out your photo/image. Make sure your image is mirrored before you print it, because we will put the printed side down on the wood. If you need a good photo editing program, I really like PicMonkey for a very user-friendly way to crop and edit images. Print your photo or image with a laser printer. I only have an ink jet printer, so I sent my photos to Staples to be printed. Use regular printer paper. You want the paper to be thin (~20lb. paper) so that it’s easy to rub off once it has adhered to the wood. 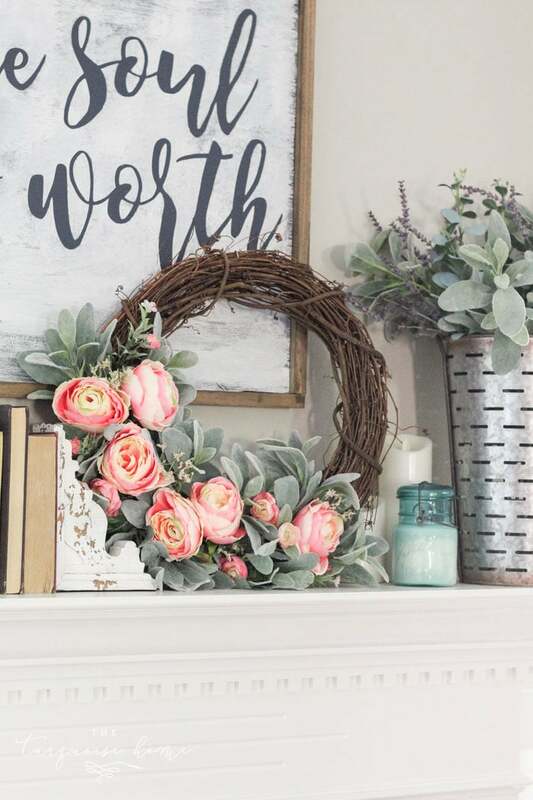 For this example I used my fall wreath printable, because it was already a mirrored image. But you can use anything you’d like. If you need to reverse an image, I’ve always used PicMonkey. But if you don’t use PicMonkey, I would just do a Google search for “how to mirror an image”. You’ll need a wood surface. 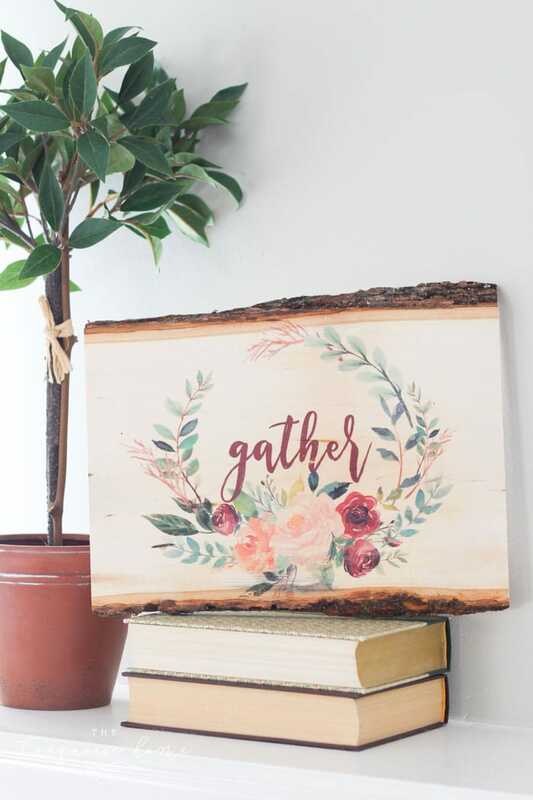 I would normally grab a piece of wood from my scrap wood pile, but I decided to be fancy and bought an exposed bark wooden plaque (click here) because I wanted the rustic details. 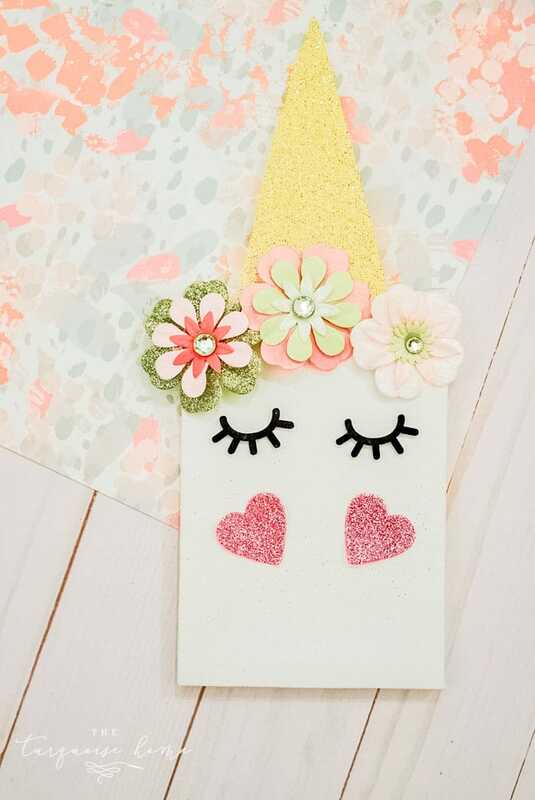 Also grab your Mod Podge, paint brush and cloth or sponge. You will obviously need your photo, too, which we covered in the previous step. Step 3. 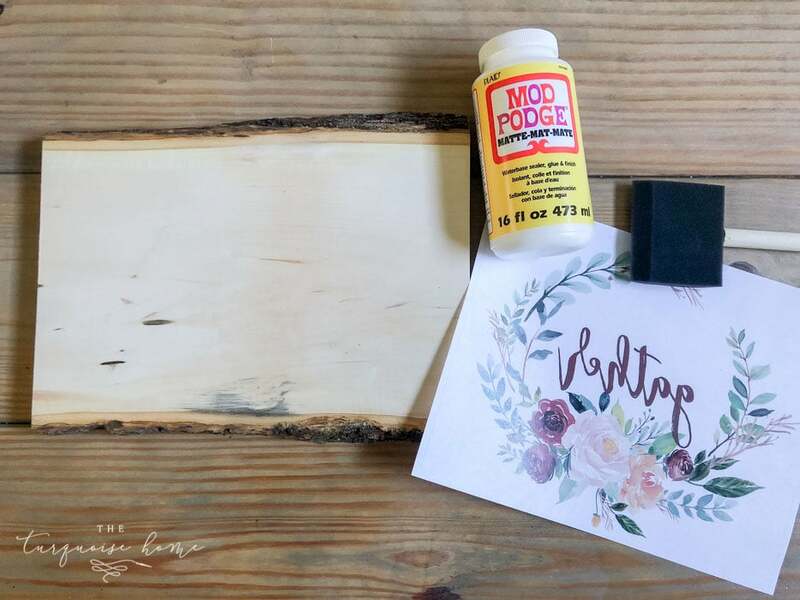 Adhere your photo/image to the wood with Mod Podge. 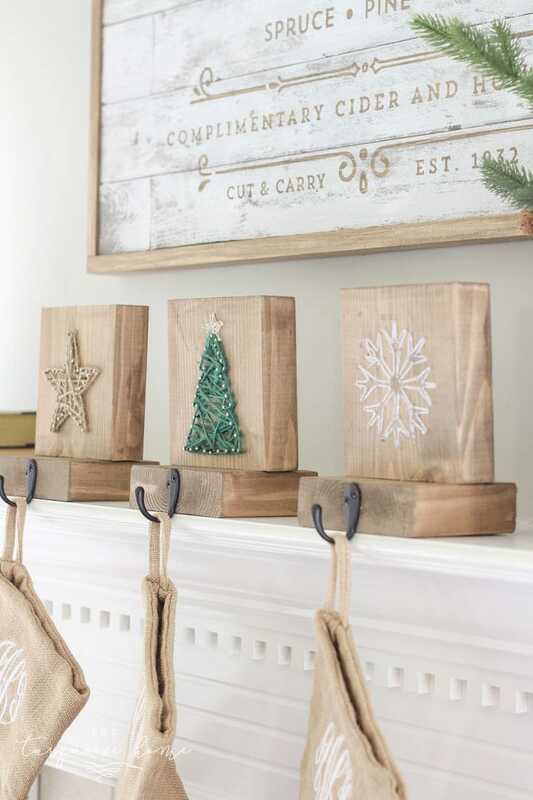 Paint a medium layer of Mod Podge on the wood until it’s completely covered. Not too light and not too thick. Then press the photo down on top of the Mod Podge, using a credit card or other object to press out any air bubbles. If there are any air bubbles, then the photo won’t adhere to the wood there. Step 3 1/2. Allow the Mod Podge to Dry. I’ve seen tutorials that recommend letting the Mod Podge dry anywhere from 24 hours to 72 hours. I let mine dry for about 48 hours and it was perfect. So, use your best judgment, but I believe the longer you can leave it to dry, the better the final project will turn out. Step 4. 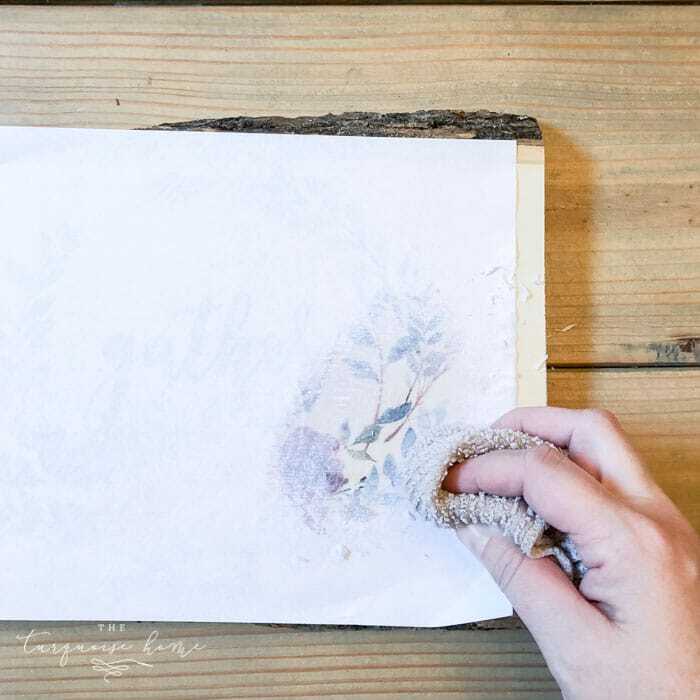 Rub away the paper with a damp cloth. Wet a wash cloth or sponge and wring out the excess water. It shouldn’t be dripping with water, but definitely wet enough to wet the paper. Then start gently removing the paper a little bit at a time by rubbing gently. You will have to make a few passes at this step because once it dries, you’ll realize there are still paper fibers on the wood. Keep going over it gently until all of the paper is gone. I could rub my fingers over it and could tell if there was still paper left or not. 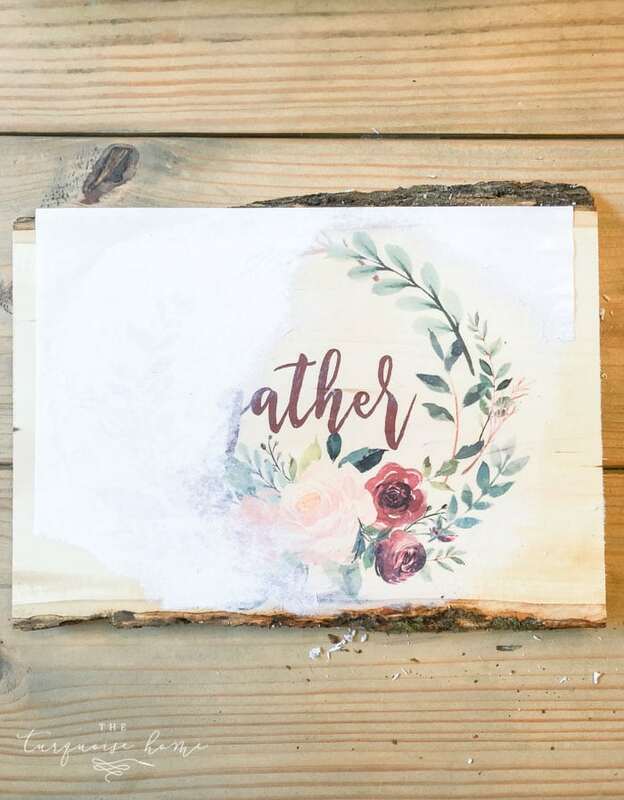 I think the final product turned out beautifully and I love that my printable has plenty of “white” space so that the wood grain & color comes through! And now I have a million ideas for how I’m going to use this method to create pretty things for my home! I’m going to use some photos of my family next as a gift idea, so I can’t wait to share those with you soon! See more of my Fall Home Tour here! Hello,I log on to your blog named “Pinterest” like every week.Your humoristic style is witty, keep up the good work! And you can look our website about free proxy list. Do you have any Christmas images? This looks really beautiful and easy. Maybe my students could make these for their parents for Christmas. If I want to transfer an old family photo, do I need to reverse the photograph image? And then send it to a laser printer? Or is this just for “word” type images? I want to take an old photo of my grandma and put it on a wood slice. What is the printer that you always recommend? My sister is in the market for a new one. Thanks, and love your projects! I’ve searched everywhere but I don’t see a “mirrored printable” on your website. Thank you. This looks soooo cute! But I cannot access the mirrored image…. And I have no idea how to mirror an image in picmonkey. Once you get to the Google drive folder, look for the files with “mirrored” in the title and those will work! And depending on what programs you have on your computer, just search for “how to mirror an image in Word” or “how to mirror an image in Paint”… I didn’t want to provide a link to a tutorial when I don’t know what programs everyone has! The link for printing takes you to a web page you have to sign up and pay for. I had a password to your printable page and that doesn’t work either. 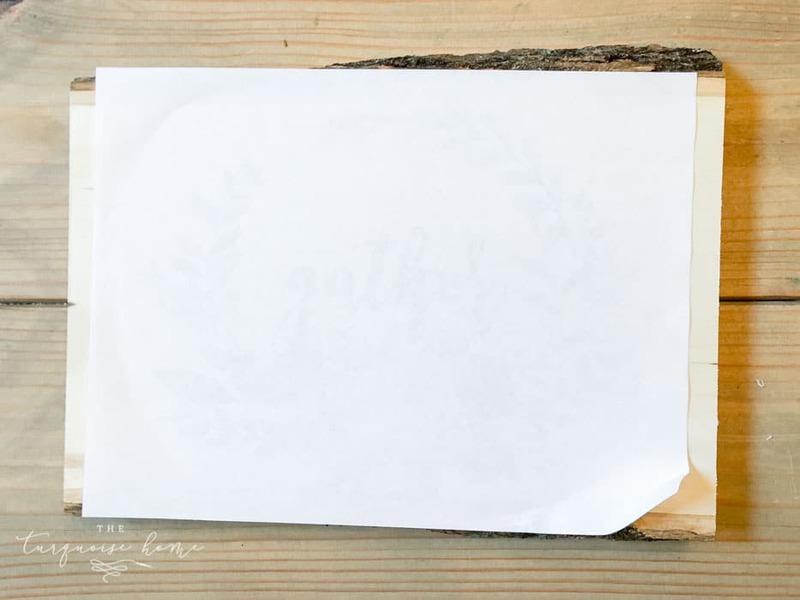 I love the photo transfer to wood with Mod Podge. I have an inkjet printer however. Will that work as well? Hi Victoria, I didn’t try it with my ink jet, but I read in other tutorials that they don’t work. That’s why I had to go to Staples. But you can try it on a scrap piece of wood and test it out! Let us know if you do! In order to download the free printables I need to sign up for Leadpages? Is that right?